1. To drive out or discharge with explosive violence. 2. To burst with a noise; to explode. 1. A natural or acquired habit or characteristic tendency in a person or thing; temperament: Almut's natural disposition is to always try to be cheerful and content. 2. An act of getting rid of something or giving it to another person: The disposition of Uncle Jim's property was easily accomplished. The safe disposition of toxic refuse is highly contested in some neighborhoods. 3. An attitude of mind especially one that favors one alternative over others: Mayor Nelson's disposition on the topic of waste management was to expand the land fill sites. Some animals and humans have sweet or sour dispositions, or personalities; and some of them also share the disposition to eat greedily, to yawn loudly, or to run around making odd noises. 4. A final settlement: The court made a final disposition of the deceased's property to specific relatives. To force a person, or people, to give up the ownership of a house, land, or other property: The new dictator of the country dispossessed many people of their land and homes. 1. The expulsion of someone; such as, a tenant from the ownership of land or other property by the process of law: There was a dispossession of Jason's next door neighbors because the couple failed to pay their taxes over a period of five years. 2. 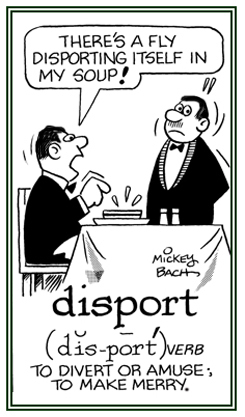 Etymology: from Old French despossesser, "to dispossess", from des-, "dis-, lack of, not" + possesser, "possess" which stands forpots-sidere, literally "to sit as a master". The first element is a contraction of potis, "able, mighty, powerful"; while the second element is related to sedere, "to sit" and "to sit down". Showing page 22 out of 35 pages of 513 main-word entries or main-word-entry groups.